mHUB’s Industry Disruptors is an event series featuring some of the best and brightest innovators of our time. 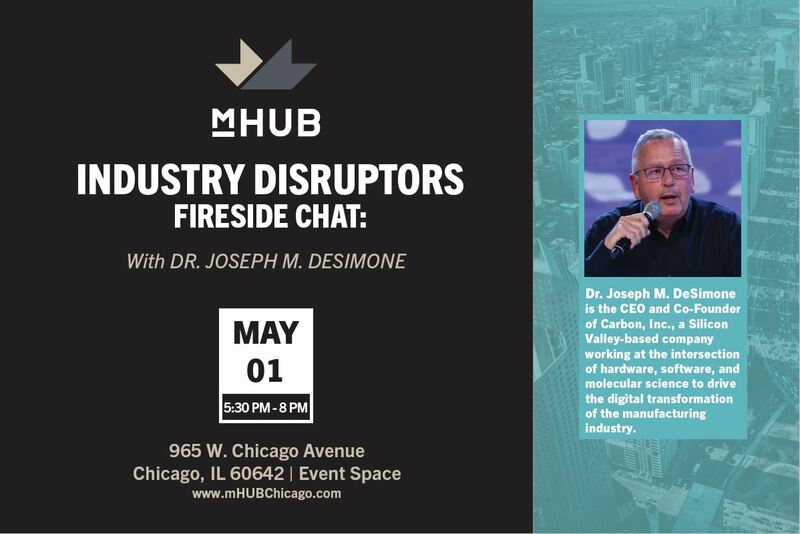 Join us on May 1 for a discussion with Joe DeSimone, CEO and co-founder of Carbon, Inc., a Silicon Valley-based company working at the intersection of hardware, software, and molecular science to drive the digital transformation of the manufacturing industry. Dr. Joseph M. DeSimone, CEO and co-founder of Carbon, Inc.
Dr. Joseph M. DeSimone is the CEO and co-founder of Carbon, Inc., a Silicon Valley-based company working at the intersection of hardware, software, and molecular science to drive the digital transformation of the manufacturing industry. Prior to this, Joe was the Chancellor's Eminent Professor of Chemistry at the University of North Carolina at Chapel Hill, and William R. Kenan, Jr. Distinguished Professor of Chemical Engineering at North Carolina State University and of Chemistry at UNC. Joe has published more than 350 scientific articles and has nearly 200 issued patents in his name, with more than 200 patents pending. Further, Joe has mentored and trained 80 Ph.D. students in his career, half of whom are women and other members of underrepresented minority groups in the sciences. Joe is one of fewer than 20 individuals who have been elected to all three branches of the U.S. National Academies: the National Academy of Medicine (2014), the National Academy of Sciences (2012), and the National Academy of Engineering (2005). He is also a member of the American Academy of Arts and Sciences (2005). Joe has received more than 50 major awards and recognitions, including the 2018 National Academy of Sciences Award for Convergent Science; the 2017 $250,000 Heinz Award for Technology, the Economy and Employment; the National Medal of Technology and Innovation, awarded by President Barack Obama in 2016; the inaugural $250,000 Kabiller Prize in Nanoscience and Nanomedicine; the 2015 Dickson Prize from Carnegie Mellon University; the 2014 Industrial Research Institute Medal; the 2014 Kathryn C. Hach Award for Entrepreneurial Success; the 2012 Walston Chubb Award for Innovation by Sigma Xi; the 2010 AAAS Mentor Award in recognition of his efforts to advance diversity in the chemistry PhD workforce; the 2009 NIH Director’s Pioneer Award; the 2009 North Carolina Award; the 2008 $500,000 Lemelson-MIT Prize for Invention and Innovation; the 2002 John Scott Award presented by the City Trusts, Philadelphia, given to "the most deserving" men and women whose inventions have contributed in some outstanding way to the "comfort, welfare and happiness" of mankind; and the 2002 Engineering Excellence Award by DuPont. In addition to Carbon, Joe is the co-founder of several companies including Micell Technologies, Bioabsorbable Vascular Solutions, and Liquidia Technologies. He received his B.S. in Chemistry in 1986 from Ursinus College in Collegeville, PA and his Ph.D. in Chemistry in 1990 from Virginia Tech. He currently resides in Monte Sereno, California with his wife of 30 years, Suzanne.